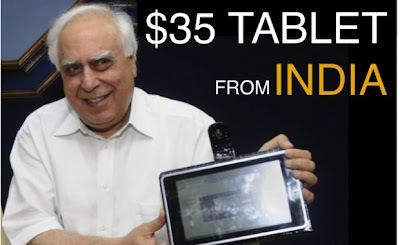 India today announced the much hyped $35 (Rs 2999) Tablet. Clearly targeted at the rural student community who don't have access to basic computing devices. This actually turns out to be the Ubislate 7 from Datawind that has been subsidized by the government from the list price of $60. The specs include a 7-inch 800 x 480 resistive touchscreen, 366MHz Connexant CPU, 256MB of RAM and 2GB of storage and a microSD slot for more memory. "(Reuters) - India launched what it dubbed the world's cheapest tablet computer Wednesday, to be sold to students at the subsidized price of $35 and later in shops for about $60."